Close Reading of 3 passages due. Observe proper formatting! (2) Choose one poem from the poetry packet and brainstorm a close reading analysis of the entire poem. (3) Borrow or buy any major anthology of English Literature and bring it with you to class. Timelines Activity in groups. (Finish for homework). HW: 1) Complete Timelines Activity to hand in next week. 2) Research and jot down some biographical info on Ernest Hemingway, Christina Rossetti, Herman Melville, Mary Shelley or any of our poets using the DNB or an anthology. How does this change your reading of a text? 3) Read and annotate your copy of “Bartleby the Scrivener.” Bring it with you to class. HW: 1) Read Barry, Psychoanalysis (Chapter 5) and Marxist criticism (Chapter 8). Brainstorm a psychoanalytic analysis of any text we've read; then brainstorm a Marxist analysis of any passage we've read. Jot down your notes. 2) Read Frankenstein, pp. 1-77. 3) Starting drafting Critical Essay. Rough drafts due in hard copy 10/19. October 5: Introducing Theory. Psychoanalytic & Marxist readings. Barry, Psychoanalysis (Chapter 5) and Marxist criticism (Chapter 8). Zizek videos 1 and 2. Brainstorm a psychoanalytic analysis of any text we've read; then brainstorm a Marxist analysis of any passage we've read. Jot down your notes. HW: 1) Write up keyword paragraphs for Psychoanalytical and Marxist Criticism. 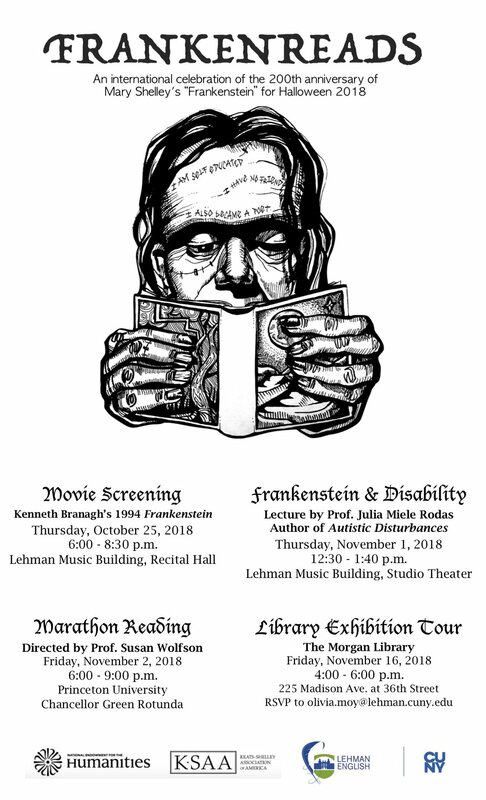 2) Read Frankenstein, pp. 78-135. 5) Rough draft of essays due. Browse the Every Single Word Spoken by a Person of Color versions of Lord of the Rings and Maleficent. HW: 1) Write up keyword paragraphs for Feminist and Postcolonial Criticism. Class meets in the lobby of Leonard Lief Library! Be sure to have your Lehman I.D. on you or you will not have access to the library. Rough drafts returned with comments. Homework: 1) Finish reading Frankenstein. Frankenstein final discussion: Finish the novel, listing vocabulary words and literary devices you encounter. Class meets at 3:45 pm at The Morgan Library, 225 Madison Avenue between 36th and 37th Streets. November 23: No class - happy Thanksgiving! Write up (and proofread!) your two Field Reports. Due by email on Nov 23. Work on your Anthology Project. HW: (1) Start your Final Essay (Option A or B) using your in-class writing spurts. Continue work on Anthology Project. (2) Bring your Anthology and Essay drafts to your conference and workshop. (3) Check your email and fill out the Course Evaluation before it expires! A link should have been sent to you from the Vice Provost. Meet in Seminar Room 301 for food & workshopping! HW: (1) Work extensively on your Anthology Project. (2) Bring a first draft of your Final Essay to your conference and workshop. Final Essays and Anthology Projects are due emailed as a PDF or Word attachment. Late assignments will not be accepted. I am happy to provide feedback and comments on drafts and final work handed on or before December 7. Field Reports due November 23. Final Essays (Option A or B) due December 14. Anthology Projects due December 20.